My Kinda Art: october 31. Hello and welcome! For today's card I used a new die from Tim Holtz called Scarecrow. There are 3 dies in the set, one is the profile of the scarecrow and the other two are crows. I wanted to bring the scarecrow to life so I did a little bit of layering. First I created a spooky background using Distress Mixed Media Heavystock, Distress Spray Stain and Inks. Next I die-cut the scarecrow from a piece of Substrate Sheet, burlap from the Textured Surfaces collection and a variety of Kraft-Core Cardstock. To create the layers I hand cut the pieces and attached them to the substrate sheet. I used the Mini Halloween 5 Stamp Set and some Craft Thread to make the sign. To add a little sparkle I die-cut the crows from some black Deco Sheet. To finish I added the jack-o-lantern. 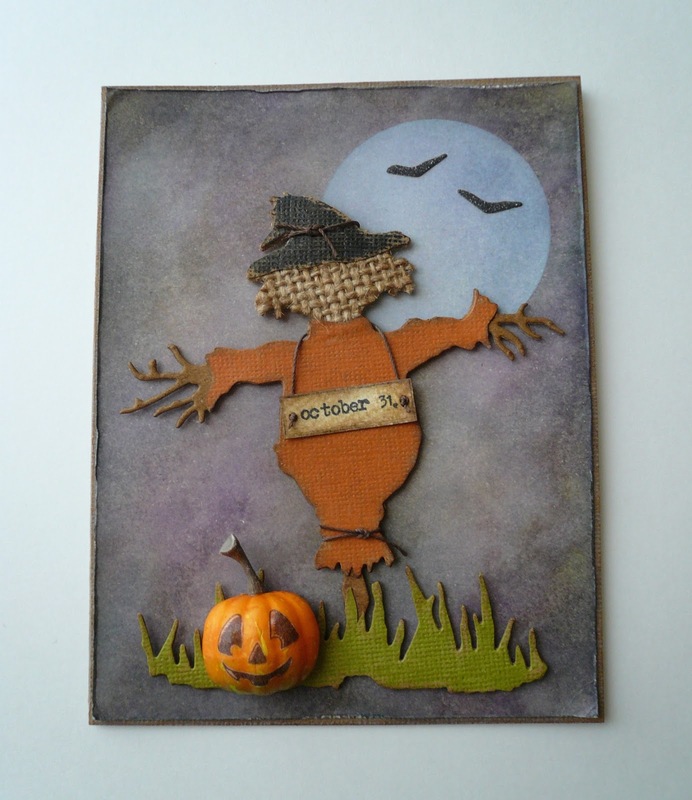 I made this little guy by cutting one of the Idea-ology Pumpkin Pieces in half, stamped the pumpkin from the Crazy Things Stamp Set on Plain Tissue Wrap, cut out the parts of the face and adhered them to the pumpkin piece. I hope you enjoyed today's post. I'll be back soon with some more Halloween projects. Thanks for stopping by!